The Guptas arrive in SA. The Guptas establish Sahara Computers. The Guptas fund Essop Pahad’s publication, The Thinker. Jacob Zuma meets the Guptas for the first time. Events at the ANC’s Polokwane elective conference mark a seismic shift in the political world. President Thabo Mbeki is ousted as president of the ANC after his attempt to secure a third term as ANC president fails. He is replaced by Zuma. In the run-up to the elections, the Guptas provide Zuma with airplanes and helicopters to take him to various locations throughout South Africa. Guptas bring the Indian Premier League to SA after it is cancelled in India due to security concerns. The acting head of the National Prosecuting Authority (NPA), Mokotedi Mpshe, announces that the corruption prosecution of President Jacob Zuma will be discontinued. Only six months in office, it emerges that Zuma’s Nkandla compound is getting a R65-million upgrade at taxpayers’ expense. The government denies the reports but later tells the Mail & Guardian’s Mandy Rossouw that no state funds will be used for the development. The Nkandla issue eventually leads to a series of cover-ups by state officials, Cabinet ministers loyal to Zuma and legal battles all the way to the Constitutional Court. Zwelinzima Vavi warns at Cosatu’s congress in 2010 that South Africa is turning into a predatory state. The political elite was feeding off state resources without care for the welfare of the republic, he said. Zuma enrages sexual health activists after it is revealed that he fathered a child with a woman who was not one of his wives. Such behaviour angers HIV-Aids activists, leading to an admission of guilt by Zuma and a personal apology to the country and the ANC just eight months into his first term. Atul Gupta and Duduzane Zuma take over as directors of the Dominion holding company. M&G reports that Zuma attended a meeting with one of the Gupta brothers and former ANC spokesperson and presidency official Jesse Duarte in February to discuss the establishment of an ANC-friendly newspaper. The Guptas and Duarte deny the meeting. Toronto-listed Uranium One says it has sold its South African subsidiary, of which the main asset is the Dominion mine in Klerksdorp, for $37-million (about R280-million) in April. The Guptas acquire part of Arcelor-Mittals’s R9bn empowerment deal, raising questions about who is eligible for state empowerment programmes. The Guptas and Duduzane Zuma scored a R9-billion deal - ahead of a consortium led by ANC chair Baleka Mbete - that gives them a stake in global steel giant ArcelorMittal worth more than R3-billion. Saying his Mabengela Empowerment Trust was worth over R1 billion, he said his Gupta partners would also be giving away 7% of their stake in the deal. A share would go to widows and widowers, orphans and dependents of police who died in the line of duty since 27 April 1994. Another would go to a bursary fund for under-privileged students studying at universities. “The inaugural award will go to the University of Johannesburg. “We will particularly target universities in historically disadvantaged areas or universities with a large proportion of students from historically disadvantaged communities,” said Duduzane Zuma..
Atul Gupta, travelling in his black BMW, is stopped by police on the R55 motor-way at about 9pm on a Saturday night. Police search his driver/bodyguard, but he refuses to be frisked when they want to search him. Sowetan reports that he boasted that he was well-connected, and that he knew police commissioner Bheki Cele. He is taken to the Sandton police station where he is charged. The Guptas launch their newspaper, The New Age. At the ANC’s national general council, Pallo Jordan holds up a copy of The New Age specially delivered to the conference. The Nkandla scandal continues to grow and so too does the Gupta-Zuma saga. The M&G reveals that one of Zuma’s then-fiancées, Gloria Bongi Ngema, landed a plum job with the Gupta family. And the president’s controversial friends may have facilitated his bride-to-be’s purchase of a R5.2-million home in the upmarket Pretoria suburb of Waterkloof. COPE MP Philip Dexter says: "In the last week, announcements have shown Duduzane Zuma to be a shareholder in the proposed new steel plant that Lazarus Zim is initiating. This comes hot on the heels of his shareholding in the ArcelorMittal deal. Apart from the blatant conflict of interest, this reveals the pattern of this accumulation by the Zuma clan. Zim, for his loyalty, has now been appointed Telkom chair." Calling for a full-scale investigation into the business interests of the Zuma family, Dexter said: "It is clear this pattern of a family enriching itself due to its relationship [with] the head of state is unashamedly playing itself out. The Guptas and Zim are being rewarded for their support of Zuma politically and financially." Brothers Ajay and Atul Gupta believe that they are losing millions of rands due to the “constant negative publicity” surrounding their friendship with President Jacob Zuma and his family. They say when government ministers visit their luxury compound in Saxonwold, northern Johannesburg, they do so as friends and not in their official capacity. On the V&A Waterfront deal, the Guptas claim their stake in the recent purchase of the property by a consortium, led by property group Growthpoint and the Public Investment Corporation, had been exaggerated in the extreme. The Guptas’ Oakbay Investments buys 33% of Zim’s Afripalm holdings. Afripalm owns 35% of Unipalm. Unipalm owns 33% of a trust, that is Growthpoint’s BEE partner, and Growthpoint has a 14% BEE equity component. Atul Gupta's driver, John Maseko, said in 2016 that he once saw Ace Magashule, in a silver Mercedes Benz, visit the Guptas for the ­Diwali festival in October 2010. Ngobeni confirmed the visit. The Free State government has been one of the main advertisers in The New Age. On Monday, after Magashule delivered his state of the province address, The New Age published a four-page supplement on the speech, written by reporters from the newspaper. Ngobeni said the province advertises in many newspapers, including City Press.? Essop Pahad breaks all business ties with the Gupta family after years of serving as the billionaire clan's key Mbeki-era ally. In 2012, DA national spokesperson Lindiwe Mazibuko writes to public protector Thuli Madonsela on two occasions, asking her to investigate whether Zuma’s family is benefitting unduly from upgrades at Zuma’s Nkandla compound. A private plane taking guests to a Gupta family wedding at Sun City lands at Waterkloof Air Force Base outside Pretoria. It later emerges that the chief of state protocol, Bruce Koloane, facilitated the landing on the instruction of “Number One”. Koloane, widely seen as a scapegoat for the debacle, is later rewarded with a diplomatic post. The incident confirms the power and influence the family enjoy because of their friendship with Zuma. Nelson Mandela dies and South Africans are becoming increasingly fed up with Zuma’s scandal-ridden presidency. With world leaders such as Barack Obama and David Cameron in the VIP seats behind him, South Africans at Johannesburg’s FNB Stadium heckle and boo their president. The sight of his face on large TV screens in the stadium sparks embarrassing screams of protest. He is hurriedly spirited away as the world watches. The Sunday Times publishes a story alleging that a rogue unit within SARS was operating illegally. "Project Spider Web" makes the claim that in the dying days of apartheid, the national intelligence and the white establishment — funded by the Oppenheimers and the Ruperts — hatched a plan to keep the nation’s finances under their control. According to the report, the major players in this were former finance minister Trevor Manuel and former director-general Maria Ramos, who have maintained their influence, and deputy director-general Andrew Donaldson, who it claims was a strategic planner for apartheid intelligence. Eskom coal scientists Mark van der Riet and Charlotte Ramavhona are suspended after conflicting lab results raisd concerns about the quality of coal Eskom received from Tegeta Exploration and Resources, the Gupta-controlled owner of Brakfontein. According to a Sunday Times report published in March 2016 a meeting between Mcebisi Jonas and the Guptas took place at about 3pm at a Sandton hotel on the last Friday of November 2014. Zuma announces the axing of Finance Minister Nhlanhla Nene and appoints the little-known Des van Rooyen. A former mayor on Johannesburg’s West Rand, Van Rooyen arrives at the National Treasury with two advisers linked to the Guptas, Mohamed Bobat and Ian Whitley. Van Rooyen stays in the job for just four days as Zuma’s announcement sends the rand into a nosedive, sparking outrage. Zuma moves Van Rooyen to a different portfolio and reappoints Pravin Gordhan, a former finance minister. A nuclear procurement programme is approved by the cabinet. Finance minister Pravin Gordhan faces trumped-up criminal charges. The case plunges the National Prosecuting Authority (NPA), the Hawks and the South African Revenue Service into a deep crisis amid allegations that these state institutions are being used to aid the Gupta family’s supposed quest to have a pliable finance minister installed. Denel announces a joint venture with VR Laser Services - a company in which the Gupta family and President Jacob Zuma’s son Duduzane Zuma hold a 25 percent stake. The joint venture, known as Denel Asia, is set to sell Denel products to the Asian market. The Hawks send Pravin Gordhan a set of 27 questions on the eve of the budget. Police minister Nathi Nhleko calls a media briefing in Parliament and, along with State Security Minister David Mahlobo, announced that the Hawks are investigating Gordhan’s role in a “rogue spy unit”. Zuma is under increasing pressure as a national fight-back campaign against state capture begins. The public protector launches her investigation into Zuma’s alleged unethical conduct and that of other state functionaries. The probe relates to claims that the Gupta family and Zuma’s son, Duduzane, are involved in removing and appointing ministers and directors of state-owned companies, resulting in Gupta-linked companies allegedly benefiting improperly and, possibly, corruptly from state deals. The Sunday Times reports that a meeting between Mcebisi Jonas and the Guptas took place at about 3pm at a Sandton hotel on the last Friday of November 2015. A letter is leaked by Sunday Independent in which the head of the Hawks, Mthandazo Berning Ntlemeza, tells Finance Minister Pravin Gordhan he has until 4pm on Monday to respond to 27 questions sent to him in February. ANC MP Vytjie Mentor reveals that the Guptas offered her the job of Minister of Public Enterprises in 2010 but only if she would stop SAA flights to India and give the Guptas the contract for SA-India flights. She said Zuma was in another room of the house when the offer was made. Mcebisi Jonas releases a public statement confirming that he was offered the job of finance minister by the Guptas. The Constitutional Court hands down a devastating judgment ordering Zuma to pay back some of the taxpayers’ money spent on upgrades at his Nkandla home. He had failed to uphold, defend and respect the Constitution as the supreme law of the land, the country’s highest court finds. In the unanimous and scathing judgment, the court finds that Zuma’s failure to comply with the remedial action ordered by the public protector was inconsistent with the Constitution. The Hawks on Tuesday said Gordhan, 66, missed two deadlines to answer questions relating to the tax agency that he led before 2009 and indicated it would force him to comply. Gordhan has described the Hawks’ statements as “threatening” and as harassment. Three foundations call on the ANC's National Executive Committee to take decisive responsibility by implementing urgent "corrective" actions in the interests of all South Africans. Signatories include Dr Frene Ginwala, chairperson of the Oliver and Adelaide Tambo Foundation, Professor Njabulo Ndebele, chairperson of the board of trustees of the Nelson Mandela Foundation and Tourism Minister Derek Hanekom, acting on behalf of the Ahmed Kathrada Foundation. The African National Congress’s decision-making National Executive Committee holds a meeting to discuss allegations against the Guptas. Zuma dares the ANC to fire him, and is supported by the majority of the NEC. The party decides that people approached by the Guptas make submissions to the secretary general, Gwede Mantashe. A group of so-called former commanders of Umkhonto we Sizwe send a signed memorandum to this meeting, calling for the recall of the party president because of alleged. They include Mo Shaik, Gibson Njenje, Siphiwe Nyanda and others. Ahmed Kathrada writes a letter to the president, calling on him to resign. Zuma survives an impeachment vote in the National Assembly. Trevor Manuel calls on Zuma to resign. Zuma is booed at Sammy Marks Square in Pretoria as he leaves a debate of the National House of Traditional Leaders. Four banks close the bank accounts of the Gupta company Oakbay, and it is reported that they approached Zuma for help. Absa and FNB banks and auditors‚ KPMG‚ and Sasfin all terminate their relationships with the Guptas. KPMG announced it would no longer audit the company’s books, and Sasfin, the family’s stock exchange sponsor, abandoned them. Atul and Varun Gupta resign their directorships of Oakbay, and Duduzane Zuma, the president’s son, resigns from his non-executive chairmanship of Shiva Uranium, an Oakbay subsidiary. The EFF’s Floyd Shivambu says the party is sticking to its claim that the Guptas moved R6-billion to Dubai. The Sunday Times publishes an article saying that Co-operative Governance and Traditional Affairs Minister David van Rooyen travelled to Dubai on December 20 2015, less than two weeks after his ill-fated appointment as finance minister, a post he held for four days. It also revealed that Mesebenzi Zwane and Zuma also visited Dubai, where the Guptas were at the time. The African National Congress (ANC) in Gauteng releases a statement saying President Jacob Zuma should resign as party and state president. The controversial Gupta-linked deal by state-owned arms manufacturer Denel is close to collapse because due processes were not followed, Finance Minister Pravin Gordhan said on Wednesday, thus making the transaction illegal. Denel and VR Laser Services - a company in which the Gupta family and President Jacob Zuma’s son Duduzane Zuma hold a 25 percent stake - formed a joint venture known as Denel Asia which would sell Denel products to the Asian market. The Gupta family’s acquisition of the Optimum coal mine from Glencore is concluded. The ANC releases its manifesto at a rally in Nelson Mandela Bay ahead of August elections, at which there is a very poor turnout. Earlier, Zuma was booed at a taxi rank and called a ‘yellow-bone’, after which he withdrew from the top six team doing walkabouts in the area. The Cabinet instructs three ministers to engage with the country’s four major banks over the closing of the Guptas’ bank accounts. The governor of the South African Reserve Bank‚ Lesetja Kganyago‚ has been asked to investigate whether banks‚ who had business relationships with the Guptas‚ complied with all the relevant provisions of the Financial Intelligence Act. Mbeki suggests that Zuma should resign. He said the fact that the Constitutional Court had to "read out a lesson" on what is meant by a constitutional democracy "illustrates that something is wrong". Finance Minister Pravin Gordhan says SAA will not receive further loan guarantees from the Treasury until a new board and management are in place. Sfiso Buthelezi deliveres his first speech as an ANC MP, and is accused by the EFF as being a Gupta proxy. Former NPA head Vusi Pikoli said the NPA's appeal against a court ruling that corruption charges be reinstated against Zuma will likely fail. Zuma denies he is at war with Gordhan. Former Nedbank chairman Reuel Khoza admonishes Zuma for firing “an experienced finance minister (Nhlanhla Nene) and for no apparent rationale or reason replacing him with a nondescript someone (Des van Rooyen) of questionable experience”. The police docket containing the case against Finance Minister Pravin Gordhan was formally transferred this week to the crime intelligence unit. A senior crime intelligence commander told City Press this week that the case was transferred to the unit because other arms of the police were “not making sufficient progress”. Only one person accepted Gwede Mantashe’s invitation to come forward with information about the Gupta family’s alleged meddling in state affairs‚ it was claimed on Tuesday. The ANC announced last week that its probe into state capture had fallen flat after only one of eight people was prepared to make a written statement, the remainder fearing reprisals. Reports emerge that minister Tina Joemat-Pettersson’s department decided, apparently without cabinet consultation, to get rid of SA’s oil reserve – all but 300 000 barrels (SA uses 450 000 a day) when the oil price was at a low of $28/barrel. The South African Communist Party (SACP) comes out in support of finance minister Pravin Gordhan, saying it "pledged to play an active role in supporting comrade Gordhan in his … patriotic struggle in defence of our democratic national sovereignty". The Guptas are among a group attempting to lobby President Jacob Zuma to reject proposed amendments to the Financial Intelligence Centre Act, a new law that will give banks the right to scrutinise the wealth of the politically connected. The Reserve Bank has demands that an Indian bank release documents related to bank accounts owned by the Gupta family. The request is part of an investigation into allegations that the Guptas may have been illegally channelling money out of the country. The upfront price for coal that Eskom has paid Gupta-owned Tegeta Resources to supply Arnot power station is higher than the export parity price at Richards Bay and among the best local prices for coal. Eskom admitted on Saturday that it had prepaid Tegeta to supply Arnot until September, in so doing, effectively giving Optimum a lifeline. Optimum is locked in a loss-making contract to supply Hendrina power station at R150/tonne until 2018. A letter written by Prasa boss Lucky Montana sets out accusations that the Gupta family and Duduzane Zuma schemed to capture the parastatal and grab a R51-billion tender for a bidder they represented. Montana wrote the letter to then Prasa board chairman Sfiso Buthelezi after discovering that the Department of Transport was preparing a cabinet memorandum to change the board. South Africans vote in one of the most hotly contested local government elections in years. The ANC loses massive support as part of a backlash against its inability to hold its leader to account. TEGETA Exploration and Resources, the mining operation owned by the Gupta family, has threatened to interdict the Treasury should it release a report into its investigation of Eskom’s coal contracts. The Treasury’s chief procurement officer Kenneth Brown conducted an investigation into Eskom’s coal contracts in the first few months of 2016, the findings of which have never been made public. Brown’s investigation followed a decision by the Treasury to review a number of contracts exceeding R10m in a crackdown on corruption. The Presidency issues a statement saying that Zuma did not have the powers to stop the investigation of Pravin Gordhan and former South African Revenue Service (SARS) officials Ivan Pillay and Johann van Loggerenberg. Gordhan, 67, may face charges over allegations that he set up an illicit investigative unit during his time as head of SARS. While Zuma expressed "full confidence" in the minister, he said he is powerless to stop the probe. At the funeral of struggle stalwart Makhenkesi Stofile’s funeral, Former foreign affairs director-general Sipho Pityana slammed Zuma, saying he had “humiliated our organisation and undermined everything that we represent”. The wealthy Gupta family, which has been accused of holding undue political sway over President Jacob Zuma, said on Saturday it planned to dispose of all the stakes it holds in South African businesses before the end of the year. Leaders of the SACP say they are ready to be removed from President Jacob Zuma's cabinet rather than remain silent about the scandals plaguing his government. More than 30 witnesses have been lined up to testify against Finance Minister Pravin Gordhan and three former SA Revenue Service (Sars) officials who may be charged as early as this week. The South African Communist Party (SACP) says President Jacob Zuma is too powerful both in the cabinet and the national executive committee of the ANC. The party has come out in support of Finance Minister Pravin Gordhan, saying the Hawks' investigation into him is an attempt to weaken the Treasury. Kebby Maphatsoe of the Umkhonto weSizwe Military Veterans’ Association and Co-operative Governance and Traditional Affairs Minister David van Rooyen launch an attack on Finance Minister Pravin Gordhan. Using their different political hats as justification, Van Rooyen calls on Gordhan to “stop running to the media” and present himself to the Hawks as requested. Cosatu condemn Maphatsoe and Van Rooyen. Mines Minister Mosebenzi Zwane is reported to have recommended to Cabinet a massive change to the Banks Act that would allow the finance minister to control bank licences. The South African Reserve Bank (SARB) is the authority that controls bank licences. Jessie Duarte, deputy secretary general of the African National Congress, told Gupta-owned news channel ANN7 on Tuesday that the Reserve Bank was failing to protect the rand. The Gupta family, owners of Oakbay Investments, have been subjected to "cruel and harsh" treatment from the media in the country, contributing to the decision to sell their local businesses, Oakbay CEO Nazeem Howa told Bloomberg on Tuesday. Despite Eskom’s statements that tests conducted by the South African Bureau of Standards (SABS) at the end of August had okayed the quality of Brakfontein’s coal, subsequent SABS tests found the opposite — Brakfontein’s coal failed to meet standards. Tegeta, which is co-owned by the Guptas and Duduzane Zuma, secured a 10-year contract to supply 1.35-million tonnes of coal a year to Majuba power station at about R284 per tonne from Brakfontein, despite minutes showing that Eskom’s technical team were concerned about the quality of the coal. A list of 13 names of new SAA board members is submitted to a Cabinet sitting on Wednesday. The Cabinet has resolved to ask President Jacob Zuma to establish a judicial inquiry into the banks and their actions against the Guptas‚ as well as to review the legislation that governs the banking system‚ Mineral Resources Minister Mosebenzi Zwane says. The Presidency on Friday distanced itself from a state-ment made by Mineral Resources Minister Mosebenzi Zwane that Cabinet had resolved to request that a judicial inquiry be established into the banks and their actions against the Guptas‚ as well as to review the legislation that governs the banking system. #OccupyLuthuliHouse demands that not only Zuma but the entire NEC resign, to be replaced by a new generation, writes Ronald Lamola, citing the movement’s history. EFF leader Julius Malema says Finance Minister Pravin Gordhan has been captured by white monopoly capital. "Pravin [Gordhan] has shares in all the companies you can think of, and then we are talking about state capture because the Guptas have captured Zwane. We don’t speak about how the Ruperts and them have captured Pravin and white monopoly capital has captured Treasury," said Malema. He said Trevor Manuel and former finance minister Nhlanhla Nene also had shares in the same companies that Gordhan had shares in. "They are all captured, they are all working for white capital," he said. Sustained intimidation and late-night appeals from party bosses stopped disgruntled ANC members from trying to shut down Luthuli House, the party's national head office, in the Johannesburg CBD, yesterday. Spokesperson Moloto Mothapo said in Friday that this was why the ruling party "rejected a proposed motion by the DA for Parliament to establish an ad hoc committee" to investigate claims of state capture. SARS Commissioner Tom Moyane and Hawks head Lieutenant-General Mthandazo Ntlemeza have known for more than three months about the alleged criminal behaviour of Jonas Makwakwa, the second most senior member of the SARS executive, who has reportedly been caught by ATM cameras feeding wads of cash into his personal account as well as receiving other deposits amounting to at least R1.2-million. The ANC’s head of economic policy, Enoch Godongwana says the Hawks pursuit of Finance Minister Pravin Gordhan is politically motivated. Godongwana believes the investigation into Gordhan is an attempt to remove him from office and weaken the National Treasury. The South African Revenue Service (SARS) has suspended its second-in-charge‚ Jonas Makwakwa‚ over allegedly suspicious and unusual payments into his accounts of R1.2 million between 2010 and 2016. SARS commissioner Tom Moyane was put on the spot in Parliament on Wednesday when he was cornered into conceding that he had not met Hawks head Berning Ntlemeza to discuss damning allegations against Jonas Makwakwa, the agency’s second-in-command. Public Protector Thuli Madonsela has served the secretary of Cabinet with a subpoena to provide the declarations of Cabinet members and the minutes of Cabinet from November 2015 to April 2016. THE UK public relations (PR) firm, Bell Pottinger, has confirmed that it was "made aware of" recommendations that an inquiry be instituted into SA’s banks before it was announced by Mineral Resources Minister Mosebenzi Zwane. MINISTER of Economic Development Ebrahim Patel has called for legislation to be passed to allow ministers’ bank accounts to be scrutinised in an attempt to crack down on corruption and state capture. He was backed up by his cabinet colleague Blade Nzimande who said state capture by "parasites" threatened democracy. PRESIDENT Jacob Zuma was informed seven months ago that he would need to give evidence in outgoing Public Protector Thuli Madonsela’s investigation into state capture. According to Madonsela’s office, the president was sent two letters, dated March 22 and April 22, and was "afforded a proper opportunity to tender his evidence". Finance Minister Pravin Gordhan and two other former tax officials have been charged on counts relating to the approval of an early retirement plan for former deputy commissioner of South African Revenue Service Ivan Pillay. Gordhan questioned why the Hawks have issued him a summons just 15 days before he delivers his medium term budget. While the ANC called on him to co-operate fully with the National Prosecuting Authority (NPA), Gauteng Premier David Makhura threw his weight behind Gordhan, as did the South African Chamber of Commerce and Industry (Sacci). On a day of violence on several university campuses, mayhem on the streets of Johannesburg and a Catholic priest being shot in the mouth by police, President Jacob Zuma was hard at work – looking for a way to wriggle out answering the Public Protector’s questions on state capture. Ajay Gupta has accused Public Protector Thuli Madonsela of not following proper processes, during her investigation into allegations of state capture involving the politically connected family. Cellphone evidence puts Des van Rooyen in the home of the Guptas on the night before former finance minister Nhlanla Nene was sacked and he was given the job according to a report. Finance Minister Pravin Gordhan has decided not to make representations to the National Prosecuting Authority (NPA) over the two fraud charges he is set to face in November, because he does not have confidence in NPA boss Shaun Abrahams. In a Financial Intelligence Centre (FIC) report, attached to court papers filed on Friday afternoon in the Gauteng division of the High Court in Pretoria, finance minister Pravin Gordhan has revealed how R6.8-billion in “suspicious and unusual transactions” may have contributed to the decision by South Africa’s major banks to close accounts associated with the Gupta family. President Jacob Zuma has brought a court action against the former public protector Thuli Madonsela to prevent her publishing a report into state capture days before her departure. Zuma may have been spooked by the public protector’s initial notice on her probe on state capture to him, in which she listed initial evidence against him indicating that he may have contravened the Executive Ethics Code and been in breach of the Constitution. National director of public prosecutions Shaun Abrahams has given Finance Minister Pravin Gordhan until 5pm today to say why he should not be prosecuted for fraud. President Jacob Zuma’s "most qualified" minister, Desmond van Rooyen, allegedly obtained assistance from Parliamentary Budget Office (PBO) staff with his academic work. ANC chief whip Jackson Mthembu has made a shocking proposal: the party’s top leaders should step down for having failed members as it moves from one crisis to the next. A whistleblower's affidavit to former public protector Thuli Madonsela lays bare how Trillian CEO Eric Wood briefed some of the company's top executives about Nene's axing during a meeting at its Melrose Arch offices in October 2015. Chief prosecutor Shaun Abrahams met President Jacob Zuma and three cabinet ministers behind closed doors at the ANC's headquarters a day before announcing his decision to charge Finance Minister Pravin Gordhan with fraud. Tokyo Sexwale said that he has launched an “independent investigation” to “test the veracity of allegations” that people within Trillian Capital Partners knew of the axing of former finance minister Nhlanhla Nene two months before it happened. The debate on Nkandla and state capture was prematurely closed by the ANC leadership, a report sanctioned by the ANC leadership revealed on Tuesday. The report, which canvassed the party’s 53 regions nationwide, also called on the president and the entire national executive committee (NEC) to resign. It was handed to its national working committee in September. President Jacob Zuma wants to postpone the court hearing on the former public protector’s state capture report‚ saying he needs time to respond to the late application to intervene by former African National Congress MP Vytjie Mentor. Sars lawyer ‘held hostage’ as NPA scrambles to shore up case against Gordhan. Finance Minister Pravin Gordhan says if reports are true that a South African Revenue Service (SARS) employee was held hostage‚ it is "totally unacceptable behaviour". One hundred and one prominent stalwarts of the African National Congress (ANC) have publically expressed their “deep concern” about the state of the country and thrown their support behind embattled Finance Minister Pravin Gordhan. The African National Congress (ANC) has summoned the Nelson Mandela Foundation to the party's headquarters to discuss any fundamental matter it may have with the party. The National Education Health and Allied Workers Union (Nehawu) has called on President Jacob Zuma to resign. Nehawu, once Zuma’s strongest labour movement ally, has dumped him. A full bench of the High Court in Pretoria on Tuesday afternoon granted the applications of four opposition political parties and former ANC MP Vytjie Mentor to intervene in the application by President Jacob Zuma to prevent the release of the state capture report. Former president Thabo Mbeki has said recalling President Jacob Zuma from office will not help the ANC regain support in the country. Mbeki reiterated remarks made earlier by ANC secretary-general Gwede Mantashe that the party’s national executive committee (NEC) should take collective blame for the decline in the party’s support during the 2016 local government elections. In a dramatic U-turn on Wednesday morning, President Jacob Zuma withdrew his application to interdict the release of the public protector’s state capture report. Former Constitutional Court judge Zak Yacoob‚ who has been a vocal critic of President Jacob Zuma‚ told the Save South Africa People's Assembly on Wednesday morning that he is no longer a member of the ruling party. The High Court in Pretoria has ordered that the Public Protector must publish the report on state capture by not later than 5pm on Wednesday. Pretoria - Economic Freedom Fighters (EFF) leader Julius Malema on Wednesday shot down the Save South Africa movement, and accused it of only standing up to protect “white monopoly capital”. Malema was addressing hundreds of EFF supporters gathered at Church Square in the Pretoria CBD. By order of the court, the 355-page report by former public protector Thuli Madonsela is released. Zuma had launched an interdict application 24 hours before the expected release of Madonsela’s report because, he claimed, he had not had enough time to respond to allegations involving him. The public protector, the report stated, had given him more than seven months but his lawyers kept on stalling. He abandoned the application on Wednesday morning and opposition parties immediately sought the order for its release. The report recommends that 1) Zuma must appoint a commission of inquiry 2) Jonas's claims about Gupta Treasury job were backed up by phone records 3) Optimum mine purchase 'highly suspicious' 4) Eskom Brian Molefe was in constant contact with Ajay Gupta 5) SABC was linked to Guptas newspaper and morning breakfast shows 6) International man of mystery Fana Hlongwane was the facilitator in Jonas debacle 7) Van Rooyen visited the Guptas every night for a week before he was appointed 8) Zuma may have to cough up money for Nkandla upgrades. The ANC says it has full confidence in President Jacob Zuma. Party spokesman Zizi Kodwa was speaking after the State of Capture report was released by the public protector on Wednesday‚ following an order to do so by the High Court in Pretoria. Embattled President Jacob Zuma received another blow on Wednesday with the news that he will face a judicial inquiry into his relationship with the politically connected Gupta family. Former president Thabo Mbeki writes a letter to Zuma, asking him not to dismiss the party stalwarts, and ‘that the current leadership of the ANC, with you at its helm, must engage the 101 Veterans with all due seriousness’. The charges against Pravin Gordhan are dropped — another extraordinary U-turn by the NPA, announced on Monday. Then, on Tuesday, charges were also withdrawn against Independent Police Investigative Directorate head Robert McBride. Staunch President Jacob Zuma defender Kebby Maphatsoe has lashed out at the 101 ANC veterans who want a meeting with the party's leadership, describing them as "empty tins", "irrelevant" and "without struggle credentials". The political fallout over the public protector's State of Capture report has taken a new turn with the Hawks revealing that they are now pursuing Deputy Finance Minister Mcebisi Jonas, ANC secretary-general Gwede Mantashe and party treasurer Zweli Mkhize. A former Gupta driver has spilt the beans on several visits by cabinet ministers, senior government officials and a top parastatal CEO to the family's Saxonwold home. A logbook and notes by Atul Gupta's driver, John Maseko, reveal how President Jacob Zuma and at least two of his senior cabinet ministers - Home Affairs Minister Malusi Gigaba and Water Affairs Minister Nomvula Mokonyane - Eskom CEO Brian Molefe; Deputy President Cyril Ramaphosa's spokesman, Ronnie Mamoepa; AU Commission chairwoman Nkosazana Dlamini-Zuma; and former government spin doctor Mzwanele Jimmy Manyi visited the Guptas' residence. President Jacob Zuma came under pressure to resign this week following damning revelations contained in the public protector's report on state capture. Now it is up to the ANC's national executive committee, the party's highest decision-making body between conferences, to decide Zuma's fate. The Sunday Times spoke to 20 NEC members to find out what their input would be if an NEC meeting were to be held tomorrow. A plan by President Jacob Zuma and his allies to reprimand pro-Gordhan senior ANC leaders was scuppered when it met serious resistance from three of the party's top six. Finance minister Pravin Gordhan is expected to be charged again next month. And this time, a determined Hawks and National Prosecuting Authority (NPA) team want to make sure they have a strong case against him and his co-accused. The new charges will relate to the establishment of the so-called rogue unit in 2007, when Gordhan was commissioner of the SA Revenue Service (Sars). Mathole Motshekga, the ANC’s chief whip in Parliament says the ANC cannot, and should not, accept collective responsibility for the actions of President Jacob Zuma and all those implicated in Thuli Madonsela’s State of Capture report. SA would not be in the political mess it is in today had Parliament acted on the Constitutional Court judgment against President Jacob Zuma in March, former president Thabo Mbeki said on Tuesday night. ANC stalwart Mavuso Msimang has welcomed as a "step forward" an invitation from secretary-general Gwede Mantashe to meet with disgruntled veterans. Brian Molefe resigns from the electricity utility. A militant President Jacob Zuma lashed out at ANC veterans at a rally in eDumbe Local Municipality in KwaZulu-Natal, organised to celebrate the party’s first municipal elections victory there. His supporters also used the event to attack Zuma’s critics, who have been calling for his removal because of his relationship with the Gupta family and their alleged capture of government departments and parastatals through Zuma’s patronage. 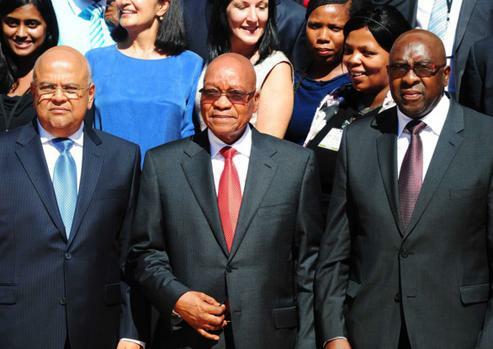 President Jacob Zuma warns ANC MPs against voting with the DA during a heated parliamentary caucus meeting on Thursday – a move that has been interpreted by some in Parliament as a sign of panic, as the president rarely attends caucus meetings. Motion of no confidence in Parliament defeated. Public Enterprises Minister Lynne Brown and Eskom chairman Ben Ngubane said on Sunday they stood by the board of Eskom and saw no reason for directors to be removed or to voluntarily step down following CEO Brian Molefe’s resignation on Friday. Mark Pamensky, the Eskom director most directly linked to the Gupta family, has resigned from the board, Public Enterprises minister Lynne Brown said on Tuesday evening. Just two days after Des van Rooyen's disastrous appointment as finance minister in December 2015, his team leaked a confidential government document to close Gupta associates. The cabinet's master plan to avoid a ratings downgrade was leaked to key Gupta friends - even before President Jacob Zuma and his ministers had seen the document. The shocking details are revealed in a string of e-mails, which the Sunday Times has in its possession. They show how Van Rooyen's special advisers, Ian Whitley and Mohamed Bobat, began an audacious takeover of the National Treasury almost immediately after the new finance minister took up his position. The National Union of Metalworkers of SA (Numsa) on Friday slams Cosatu’s decision to endorse Cyril Ramaphosa to replace Jacob Zuma as president of the ANC in 2017. President Jacob Zuma is to be be questioned next week by the ANC’s integrity commission following persistent allegations of corruption and poor election results, the party said on Friday. Zuma calls for ANC members to emulate him, saying he is a “political genius” who liberated the country and founded the ANC political school in Robben Island. Gauteng Hawks boss major-general Prince Mokotedi alleges that Robert McBride‚ former Hawk Shadrack Sibiya and Paul O’Sullivan conspired to murder him and Hawks boss lieutenant general Mthandazo Ntlemeza. He further claims they planned to use information gathered on Duduzani Zuma‚ president Jacob Zuma’s son‚ “to mobilise the community to revolt and pressure the President to quit office”. Nedbank CE Mike Brown reveals that Communications Minister Faith Muthambi was part of the interministerial committee delegation he met with to discuss the closure of Gupta bank accounts. At an ANC Youth League meeting Zuma asks if he will have support if he fires Pravin Gordhan. “Some call it the disaster‚ the Nene disaster. Is the nation aware of what needs to be done to the economy? That’s the issue because any president is not going to tell you why they took such a decision‚ because you don’t have to explain. There are a number of reasons why you put in a minister or remove a minister. You don’t have to explain‚” he said. At the same event, YL leader Collen Maine said Zuma should model humself on Vladimir Putin. "The policies of Putin are very progressive. We are more afraid of the rating agencies than the masses. The US showed that they could elect an anti-markets candidate and they are not in junk status. Here we are receiving grants from social development‚ we are already in junk status." President Jacob Zuma snubs Deputy President Cyril Ramaphosa, telling SABC radio stations that it was not ANC policy for a deputy to ascend to the highest office. New public protector Busisiwe Mkhwebane wants Absa to pay R2.25bn to the fiscus in compensation for a loan which was found by several investigations to have been irregularly made, the M&G reports. Former Public Protector Thuli Madonsela says she is afrod that the country is being run by the Guptas. Madonsela also says she noticed how the use of the phrase “white minority capital” had started to flourish in the wake of her report and said she had read how governments in Africa “whip up ethnicity as an issue”. But‚ she added‚ “the answer to white minority capital is not having two families enriching themselves through state resources”. A group of ANC veterans and the party’s top officials met to discuss when a national consultative conference (NCC) should be held. The stalwarts, who have expressed concern about the state of the ANC, said they had met the top six officials at Luthuli House on Monday. Vardospan, a joint venture between Cinq Holdings, a company controlled by Salim Essa, a close business associate of the Gupta family and Hamza Farooqui’s Pearl Capital, is proposing to acquire Luxembourg-based Pitcairns Finance’s interest in Habib Overseas Bank’s domestic operations. But the deal has to be passed by the finance minister to go through. The eThekwini region’s ANC Youth League said on Thursday President Jacob Zuma must fire Finance Minister Pravin Gordhan for failing to transform South African Airways (SAA). Finance Minister Pravin Gordhan’s affidavit submitted in 2016‚ saying that he couldn’t intervene in the decisions by the banks to stop doing business with the family, is “riddled with factual and legal errors”, The Guptas lawyer said in court. He also said “its reliance on the list of 72 purported ‘suspicious transaction reports’ is misplaced’. In its affidavit‚ Oakbay claimed “sources” had revealed that Gordhan‚ in a meeting with 60 captains of industry‚ had stated that steps had to be taken to “clip the wings” of the Gupta family. Treasury accused Oakbay of making “sensational and politically-driven claims and allegations”‚ which it said were designed to deflect from the primary issues raised in the minister’s declaratory order. Hawks head Berning Ntlemeza informed the Gupta family through their lawyer, Gert van der Merwe, a week ago that they were not under investigation — even though the Hawks had received reports of 72 suspicious transactions through their businesses’ bank accounts from the Financial Intelligence Centre (FIC) in the past four years. Finance Minister Pravin Gordhan has accused the politically connected Gupta family and their associates of plotting against him and the Treasury. President Jacob Zuma hit out at the Treasury at the ANC’s lekgotla for frustrating the party’s economic transformation agenda, sources who attended last week’s three-day meeting said. The Bank of China closed the Gupta accounts just three weeks after they were opened because of perceived political risk. President Jacob Zuma’s son‚ Edward‚ has launched a scathing attack on Finance Minister Pravin Gordhan‚ accusing him of having "shares everywhere"‚ using his connections to make a profit and trying to sell South African Airways to a relative. Public protector Busisiwe Mkhwebane is backing President Jacob Zuma's argument that Thuli Madonsela's recommendation that the chief justice should appoint a judge to head the inquiry into state capture is flawed. Parliament descended into chaos on Thursday as opposition parties denounced President Jacob Zuma as he tried to deliver the State of the Nation Adress. They said he was a “scoundrel” and “rotten to the core” because of corruption allegations before guards dragged them out of the chamber. In an affidavit‚ Ajay Gupta denied meeting or speaking to Mcebisi Jonas. The Mail & Guardian reported on Friday that Jacob Zuma and Cyril Ramaphosa 'can’t stand each other'. Deputy Finance Minister Mcebisi Jonas filed an affidavit saying he met Ajay Gupta‚ and was offered a promotion and R600m in exchange for bringing business deals to the Gupta family. A report says that six days after the Gupta family infamously “fled” South Africa in 2016 on a late-night flight, a second Gupta plane tried to leave with a box believed to have been full of diamonds. Pravin Gordhan delivers his Budget speech in Parliament. Former Eskom chief executive Brian Molefe is sworn in as an MP - a move that is likely to fuel speculation about a pending reshuffle of President Jacob Zuma's Cabinet. The new notion of radical economic transformation is nothing but rhetoric meant to further enrich the elite, the SA Communist Party said on Sunday. City Press reports that after unsuccessfully pursuing Finance Minister Pravin Gordhan, the Hawks have now set their sights on his deputy, Mcebisi Jonas. The Hawks’ Crimes Against the State (Cats) unit is gathering evidence that could implicate Jonas in a case of corruption involving a supplier to SAA’s aviation maintenance division, SAA Technical (Saat). Finance Minister Pravin Gordhan described as "ridiculous" a comment by the South African Revenue Service (SARS) that reporting to him was an "operational courtesy" rather than a legal requirement. The Black Business Council (BBC) has confirmed that Finance Minister Pravin Gordhan accused the lobby group of trying to capture the Treasury on behalf of the Guptas. Ahmed Kathrada undergoes brain surgery. Zane Dangor, the director-general of the Department of Social Development resigns. The Minister of Social Development Bathabile Dlamini announces she will brief members of the media on “progress regarding the institutionalisation of the social grants payment system within the South African Social Security Agency (Sassa) beyond the 31st March 2017 when the current contract with Cash Paymaster Services expires”. Forces that aimed to undermine the government, are abusing the judiciary and the media, among other institutions, to achieve their aims, State Security Minister David Mahlobo said on Sunday. Ad hoc committee on SABC recommends that Communications Minister Faith Muthambi be fired. The ANC releases its policy proposals, saying wants a greater concentration of power in the Presidency, and that the president must have greater control over the Budget. Social Development Minister Bathabile Dlamini and a few hand-picked advisers have emerged as the clique that constructed the illegal new contract with Cash Paymaster Services (CPS), excluding officials of the department and the South African Social Security Agency (Sassa) from the process. Science and Technology Minister Naledi Pandor says some of her cabinet colleagues are living beyond their means. Ahmed Kathrada dies at about 4am on Tuesday morning. After conferring with Muslim clerics and others, the family decide to hold the funeral the next day, on Wednesday. Zuma is told he is not wanted at the funeral. Kathrada is buried after a memorial service that turns into an anti-Zuma rally. The South African Communist Party has confirmed that President Jacob Zuma had informed them of his intention to effect a cabinet reshuffle. Late on Thursday night, Zuma announces his cabinet reshuffle, firing nine ministers including finance minister Pravin Gordhan and his deputy, Mcebisi Jonas.